Roughing it and enjoying the outdoors does not necessarily mean you have to let go of the of all modern conveniences just to have fun. You still need some modern tools that can really help you out when you are camping out. A good stove to cook your food can matter a lot. And this new Aquaforno II Portable Outdoor Cooking Stove will ensure that you have options. The Aquaforno II Portable Outdoor Cooking Stove is an all-in-one stove that will make your camp out more convenient and comfortable. It can be used to cook food in many different ways. 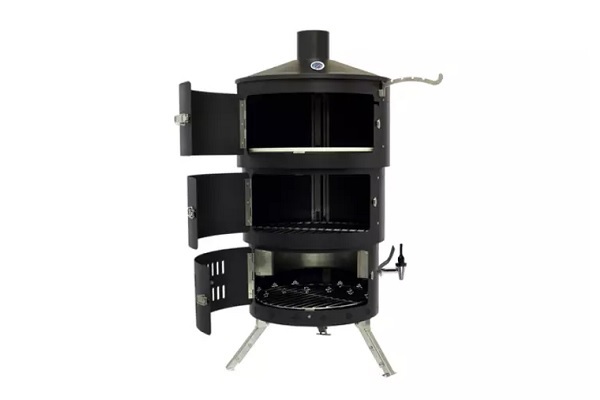 It works as a BBQ grill, oven, rotisserie, and even to boil or heat drinks. Campers out in the cold can also use it as a heater as well. The Aquaforno II Portable Outdoor Cooking Stove is also versatile in that it can also make use of a variety of fuel sources for cooking, whether it is charcoal, wood or gas. Despite its many features, this all-in-one stove is easy to carry, thanks to its telescopic design. It comes with its own backpack for convenient transport and storage. The Aquaforno II Portable Outdoor Cooking Stove is currently available for pre-order at Kickstarter, starting at $239. It is expected to be available by July of this year.